When many reflect on the 1990s Mariners, often the flashier stars jump to mind: Ken Griffey Jr., Randy Johnson, Alex Rodriguez. However, few on those teams would disagree that the stalwart of the Mariners was a player who toiled just outside of the spotlight. Known as Gar, El Papa, or Papi, Edgar Martinez was the quiet, hard-working hitting machine who was the heart of the Mariners. Chants of “Eeeed-gaaaar” reverberated throughout the Kingdome during every Martinez at-bat, and Martinez’s name became synonymous with the designated hitter position at which he excelled. A Mariner for his entire career, his legacy is strongly felt in Seattle even to this day. Edgar Martinez was born on January 2, 1963 in New York City to parents Jose Martinez and Christina Salgado Martinez.1 When he was two years old, his parents divorced, and Martinez went to live with his grandparents, Mario Salgado and Manuela Rivera, in the Maguayo neighborhood of Dorado, Puerto Rico. He improved the following year with the Wausau Timbers of the Midwest League, hitting .303 and drawing 84 walks. Martinez split the 1985 season between the AA Chattanooga Lookouts of the Southern League, where he hit .258 in 111 games, and the AAA Calgary Cannons of the Pacific Coast League, .353 in 20 games. Back in Chattanooga in 1986, he led the league third basemen with a .960 fielding percentage. In 1989, Martinez began the season with the big league club in Seattle. Joining him in the Opening Day lineup were fellow rookies Ken Griffey, Jr. and Omar Vizquel. Martinez struggled early on and again split his time between Seattle and Calgary. The consistent playing time in the minors lifted him out of his rut. “When I was sent down I played every day and I found my rhythm,” Martinez said. “[I] was more comfortable and secure with myself.”9 Unlike many players who became discouraged by living in constant flux between the major and minor leagues, Martinez embraced his situation. “I saw other players who were very frustrated by playing in the minor leagues, but I was lucky,” said Martinez. “I never got frustrated. I was doing what I really liked. I was just happy to be playing the game.”10 Cumulatively, he hit .345 in 32 games at Calgary, and .240 in 65 games with Seattle. Before the 1991 season, Martinez signed a two-year contract for $850,000 plus incentives.16 He began the season on an offensive tear, hitting .412 through the month of April. Manager Lefebvre experimented with putting Edgar at nearly all spots in the lineup, including 67 games in the leadoff position later in the season. His strongest performance came in the cleanup spot, where he hit .380 in 71 at bats. He finished the season again hitting over .300 with an overall WAR of 6.1. The bad luck continued early in the 1994 season, however, as Martinez was hit by a pitch on Opening Day while facing Cleveland right-hander Dennis Martinez. “I thought, ‘Not again,’” Martinez said. “I couldn’t believe it was my first game.”27 Returning to play nearly a week later, he made three errors in a game. After a stint on the disabled list, Martinez went on to appear in 89 games of the strike-shortened season. He played 65 games at third base, 23 as designated hitter, and appeared once as a pinch runner. Martinez roared back into form in 1995. Playing nearly all games as a designated hitter, he had the best season of his career leading the American League in runs (121) and batting average (.356), he led the major leagues in doubles (52), on-base percentage (.479), and OPS (1.107). He also earned an impressive offensive WAR of 7.2 He was selected to his second American League All-Star squad, won a second Silver Slugger, and finished third in MVP voting. Martinez gave the Mariners a much-needed boost after star player Griffey, Jr. went on the disabled list on May 26. Twenty-five of his 29 home runs, and 97 of his 113 RBI came after Griffey’s injury.28 Due in no small part to Edgar’s achievements, the Mariners went on to win their first-ever AL West division championship. In their playoff debut, the Mariners faced the Wild Card Yankees in the ALDS. Martinez swung a hot bat for the entire series, getting three hits in each of the first two games, for example, although the Mariners lost both contests. The M’s battled back to win Game Three, in which Martinez buoyed the team with a grand slam home run. And they also captured Game Four, with Edgar contributing a three-run dinger in that victory. Edgar did not waste his chance. On an 0-1 count, he laced a split-fingered fastball into the left-field corner. Cora scored easily, while Griffey kicked into overdrive from first. As the entire team waved him in along with third base coach Sam Perlozzo, Junior slid safely into home, securing the Mariners their first Division Championship and sending the Kingdome into an eruption. Martinez had a monstrous series: hitting an electric .571, with two homers and 10 RBIs. “A professional is the best description I can use for him,” Piniella said. It’s the highest praise I can think of for a major-league baseball player.” Griffey added, “People are always asking about Edgar. What can you say? He’s just Edgar. The man can hit.”30 Though the Mariners went on to lose the ALCS to Cleveland, the dramatic Game Five ALDS victory has not been forgotten. Even today, 20 years later, ”The Double” is permanently etched in collective memory and franchise lore. It’s depicted in a Safeco Field mural and was constantly re-lived for 15 years through the baritone voice of the late Ford C. Frick award-winning Mariners broadcaster Dave Niehaus. Fortunately, the Mariners remained in the AL where Martinez continued to produce. Over the next two years he batted .327 and .330 and led the AL in OBP, something he accomplished three times in his career. Indeed, he excelled at getting on base: for two-thirds of his 18-year career, he earned an OBP over .400. In 2000 he led the AL in RBI (145), was selected to his fifth All-Star team, had a career-best 37 home runs, and finished sixth in MVP voting. He also hit .364 in the ALDS as the Mariners swept the White Sox, but they ultimately fell to the Yankees in the ALCS. 2001 was a magical year for the Mariners: the team tied the 1906 Cubs’ record of 116 wins in a season. Martinez was one of eight Mariners selected to that year’s All Star Game, which took place on their home field. In the Division Series against the Indians, Martinez hit .313, but only .150 in their Championship Series loss to the Yankees. It would be his final playoff appearance. A ruptured hamstring tendon behind his left knee shortened Martinez’s 2002 season and he again underwent surgery in April. Whether Martinez, then approaching 40, would play another year was questionable. But the Mariners weren’t quite ready to let the heart-and-soul of their team go, and signed him to a one-year deal. “We just had to get it done,” said the M’s CEO Howard Lincoln.34 Martinez rewarded the franchise’s confidence, rebounding from his injury in 2003, hitting .294 with 24 home runs, .403 OBP and a strong 3.3 WAR. Buoyed by his season, Martinez signed another one-year deal with the Mariners in November. Though he retired from playing baseball, the always hard-working Martinez could not remain idle during his retirement. In addition to spending more time with his family—by then, he and wife Holli had three children: a son, Alex, and daughters, Tessa and Jacqueline—Martinez also launched a promotional merchandise agency called Branded Solutions. When asked why he didn’t just retire to a life of leisure, spending his post-playing days on the golf course, Martinez said, “I tried that. But I felt the need to be productive. I feel energetic. I feel young. I wanted to do something.”40 Martinez and his wife also founded The Martinez Foundation, a charitable organization that provides scholarships and support programs to students of color who are pursuing teaching careers. 1 David L. Porter, Latino and African American Athletes Today: A Biographical Dictionary, (Santa Barbara: Greenwood Publishing Group, 2004), 253. 2 Ian C. Friedman, Latino Athletes, (New York: Infobase Publishing, 2007), 133. 3 Larry Stone, “Martinez is still the talk of his town,” Seattle Times, October 4, 2004. 4 Bob Finnigan, “Double Play—Cousin Carmelo Talked Edgar Martinez into Taking a Chance, Signing with M’s,” Seattle Times, March 7, 1993. 5 Porter, Biographical Dictionary, 253; ibid. 6 Blaine Newnham, “Mister Muscle—Martinez Gives M’s a Lift,” Seattle Times, May 24, 1990. 7 Bob Sherwin, “Martinez, Diaz Help Save M’s Moore from Embarrassment,” Seattle Times, October 2, 1987. 8 Ibid., “Christensen Reassigned; 6 Others Get Ax,” March 22, 1988; Bob Finnigan, “Parker’s Bleeders Killed Mariners,” Seattle Times, April 5, 1988; email, Rick Griffin to author, October 27, 2015, in author’s possession. Griffin is the M’s senior director of athletic training. 9 Bob Sherwin, “Majors Top Minors for M’s—Martinez, Briley Show They Plan to Stay in Win Over Blue Jays,” Seattle Times, June 19, 1989. 11 Bob Finnigan, “Reynolds Looks Like a Million; Presley Looks Like a Red Sock,” Seattle Times, January 14, 1990. 12 Jim Cour, “Mistakes Don’t Rattle Martinez—M’s Third Baseman Swings Hot Bat,” Seattle Times, May 20, 1990. 15 Bob Sherwin, “M’s Finish Season with 7-4 Loss—Seattle 1 Victory Short of Matching Best-Ever Season,” Seattle Times, October 3, 1990. 16 Bob Finnigan, “Valle Overcomes Contract Dispute to Report on Time,” Seattle Times, February 23, 1991. 17 Bob Sherwin, “Edgar—All-Star Dream Comes True for Sore-Shouldered Martinez,” Seattle Times, July 10, 1992. 18 Ibid., “M’s Invest in Future—Martinez Signs for Hot Numbers: 3 Years, $10M,” Seattle Times, August 14, 1992. 19 Bob Finnigan, “Make Way for Martinez—League’s Top Hitter Finally Gets Noticed Outside Seattle,” Seattle Times, August 25, 1992. 20 Bob Finnigan, “Edgar was a one-man hit parade – injuries sapped his legs but couldn’t derail him,” Seattle Times, October 4, 2004. 21 Ibid., “Edgar’s Season May Be Finished—Shoulder Surgery Possible for Martinez,” September 16, 1992. 22 Connie McDougall, “Rooting for the Home Team,” Response, Winter 1997. 25 Ibid., “M’s Lose Edgar for Up to 6 Weeks— Martinez Sidelined After B.C. Mishap,” April 4, 1993. 27 Bob Sherwin, “Mariner Log – Edgar Gets a Scare in First Trip to Plate,” Seattle Times, April 5, 1994. 28 Ibid., “Martinez Gets Summertime Due – Finishes 3rd in MVP Vote After Lifting Griffey-Less M’s,” November 17, 1995. 29 Bob Finnigan, “Miracle Mariners – Pair of Aces, Edgar’s Clutch Hit Ends Series for the Ages in 11th,” Seattle Times, October 9, 1995. 30 “What They’re Saying About Edgar,” Seattle Times, October 9, 1995. 31 “Mariners ’96: A Look Back,” Seattle Times, September 30, 1996. 32 Glenn Nelson, “Martinez Uncertain About Future—Wants to Stay, But Has No Say,” Seattle Times, October 6, 1997. 33 Ken Rosenthal, “Martinez Keeps Hits Coming Despite an Eye Disorder,” Sporting News, May 6, 2001. 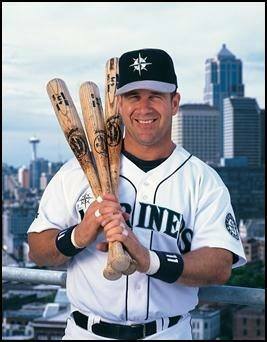 34 Bob Finnigan, “Back in the Fold – Martinez Agrees to One-Year Deal with Mariners,” Seattle Times, November 8, 2002. 37 Art Thiel, “Seattle to Rename Street After Edgar Martinez,” Seattle Post-Intelligencer, September 30, 2004. 38 Bob Finnigan, “A tip of the cap – Rangers 10, M’s 4 | Seattle Honors Retiring DH with a Moving Tribute | Edgar Martinez Day”, Seattle Times, October 3, 2004. 39 Steve Kelley, “Martinez Receives Clemente Award – ‘It Means a Lot’,” Seattle Times, October 27, 2004. 40 Greg Johns, “Edgar’s Life After Baseball,” Seattle Post-Intelligencer, February 16, 2007. 41 Ryan Divish, “Mariners hire Edgar as New Hitting Coach,” Seattle Times, June 21, 2015. 43 Jerry Crasnick, “Randy Johnson: Vote Edgar Martinez,” ESPN.com, January 7, 2015, http://espn.go.com/mlb/story/_/id/12132849/randy-johnson-endorses-former-seattle-mariners-teammate-edgar-martinez-baseball-hall-fame. 44 Steve Kelley, “Loud Bat Belied the Quiet Pro Behind It,” Seattle Times, October 4, 2004.